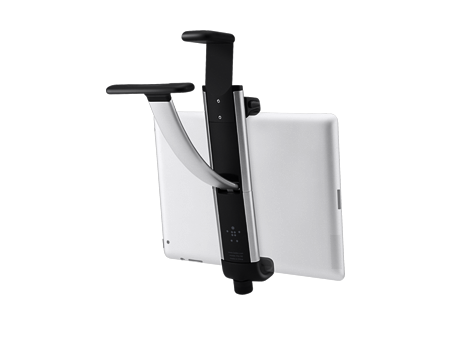 The Kitchen Cabinet Mount helps keep your tablet in view and securely suspended on any cabinet or shelf. Bring your tablet into the kitchen without cluttering the counter. The Kitchen Cabinet Mount helps keep your tablet in view and securely suspended on any cabinet or shelf. No tools or hardware are needed and no permanent installation is required. Simply attach the mount using the secure adjustable clamp. It can be easily repositioned to fit different cabinet and shelving units, or removed for storage.